AMD has unveiled its new Ryzen Pro desktop processors, aiming to bring speedy performance, as well as security and reliability to business PCs. 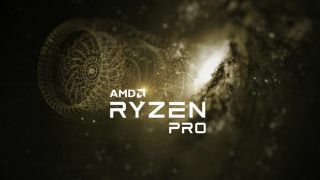 The Pro range mirrors the consumer Ryzen CPUs, with baseline offerings being named the Ryzen 3 Pro, which steps up to the Ryzen 5 Pro, with the top-of-the-line processors being the Ryzen 7 Pro. Ryzen 3 Pro models will be quad-core (four-thread) with the entry-level CPU running with a base clock speed of 3.1GHz with boost to 3.4GHz, and a TDP of 65W. The Ryzen 5 Pro 1500 will also be quad-core but with eight-threads, a clock speed of 3.5GHz/3.7GHz (boost) and the same TDP. With the Ryzen 5 Pro 1600, AMD has gone with six-cores (12-threads) and a clock speed of 3.2GHz/3.6GHz. Moving to the top-tier, the Ryzen 7 Pro 1700 will have eight-cores (16-threads) and a clock speed of 3GHz/3.7GHz, again maintaining a TDP of 65W. The flagship model is the Ryzen 7 Pro 1700X which is also an eight-core (16-thread) CPU but it bumps the clock speed up to 3.4GHz/3.8GHz, although in this case the TDP rises to 95W. AMD claims that in Cinebench R15 benchmarking, the Pro 1700 beat out Intel’s Core i7-7700 by 62% in multithreaded performance. In terms of security, AMD notes that the new processors benefit from a built-in AES 128-bit encryption engine, and the likes of secure boot, firmware TPM 2.0, plus support for Windows 10 Enterprise security features. On the reliability front, the chipmaker asserts that Ryzen Pro products are sourced from wafers with the highest yields, delivering commercial-grade quality to help ensure a long lifespan of the CPU. You also get open standard DASH manageability, meaning CPU-agnostic admin to ensure that businesses avoid getting locked into a proprietary solution. Pricing hasn’t yet been talked about, but AMD says that the Ryzen Pro range will be available worldwide in the second half of this year. Ryzen Pro Mobile processors are expected to arrive in the first half of 2018. But will AMD's influence spread to the best laptops?